Kasey Tarnow has a simple solution for anyone who wants to make a difference for the coastal environment in her hometown, San Clemente, California. Her Girl Scout Gold project is to convince people to move cars or other obstructions so the city's street sweeper can do its job. That's why last fall she launched "My Street, My Ocean," a public awareness campaign targeting streets that don't have street-sweeping signs. 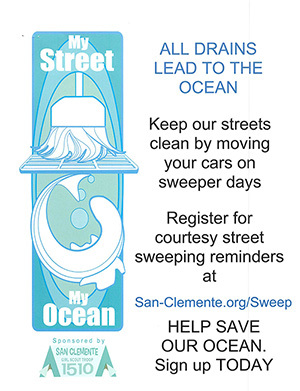 San Clemente doesn't ticket parked vehicles blocking the sweeper on those streets. At present, warning signs and ticketing only apply to high-density neighborhoods. Q. What inspired "My Street, My Ocean?" A. When I would go to the beach I would see trash and it bothered me. Then I started noticing trash in the gutters and that bothered me. Then we had a really big storm and I saw trash and tree branches and bushes all running downhill into the storm drain. The storm drains were getting clogged up because the trash kept the water from going down the drain. It was blocking the water flow. I started thinking why is there so much trash and leaves and branches? I thought about it and talked to my Girl Scout troop. Q. What did you find out? A. I realized that the sweeper would go around cars and could not get all the trash. And I thought there are no signs telling when the sweeper comes. I did not see any in front of my house or my friends houses. I went to the city with the idea that we need to send reminders. I asked them if they would consider helping me get a website set up and a system to get people to know when the sweeper came to their street. They told me they already had one, but hardly anyone knew about it. I said to myself, I can fix this. A. You sign up on the website, and you get an email and a text reminder the day before the sweeper comes. That way you can move your car, or tell your friends not to park on the street. Q. How successful is it? A. Most people who hear about it think it is a good idea. I hung posters up downtown in October, but I need to do it again because most of the signs have been taken down. I organized several troops and many girls to walk door to door with my poster. The girls collected emails and cell phones. I put all the information in the computer to sign the people up. I went to the high school and talked to the Blue Oceans club. I met with The Watershed Task Force. Now everyone has more ideas on how to spread the word. Most everyone wants to help keep the ocean clean and beautiful. Q. Why is it a big deal for people to move their car? A. The sweeper cannot get the trash when the cars are in the way. It cannot clean underneath the car. It just goes around it. Then that trash will go into the storm drain and out to the beach water. Q. Do you have any numbers from the city? 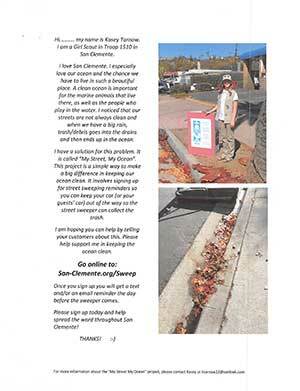 A. I was told that the sweeper picked up over 4,000 tons of trash in 2-3 years in San Clemente. That tells you the sweeper can make a big difference. Q. What are some reactions to your campaign? A. I have gotten messages by email of people wanting to donate money to help. I have had people post on social media about my project, and others tell me they posted links with information on their websites. I think most everyone agrees we need to do it to help our ocean, but so many people still do not know about it. Many thanks to author Fred Swegles and the Orange County Register for allowing us to reprint this article that originally appeared in that publication. If you are a municipal reader in a city that doesn't already require vehicles to be moved prior to sweeping, you may want to contact your local Girl/Boy Scouts to see if someone in your area may be interested in doing something similar to the above. If you have questions or comments about this article, be sure to let us know. 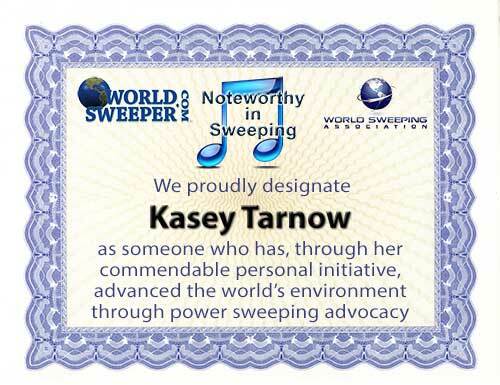 Thanks to the efforts of this article's primary author, Fred Swegles of the Orange County Register, the WorldSweeper staff was able to contact Kasey's mother, Renee. She sent us the following email, as well as Kasey's handouts, which are shown and linked below. 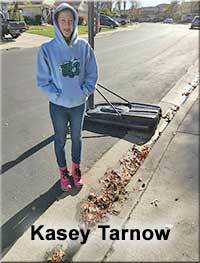 Thank you for contacting Kasey regarding her Girl Scout Gold Award project, "My Street, My Ocean." Attached is her flyer and the poster she created for the campaign. I have cc'd her advisors so they know she is passing along her information to you. Feel free to use this information to help others get ideas. You never know who might try to do this in their city! Kasey worked on this for over a year and was extremely successful in getting people to sign up for sweeper notifications. The city maintains the website and its a win-win for everyone involved. We had a chance to look at your website www.worldsweeper.com. It looks like you keep extremely busy educating and advocating for cleaner streets. We salute you! Helping keep the streets clean is very important. We wish more people would become involved. We have some ideas for keeping the campaign alive here in San Clemente. It would be great if other beach communities could do the same. Thank you so much for all your efforts! Note: Click on either of the images below to access the item in its original, full-size. These are provided in order to give you ideas of how you can spread this idea to your own community!